The members of the Garden Club of Irvington-on-Hudson are delighted to bring you this selection of photos of our flower show at the Lyndhurst Carriage House. The theme, “On the Sunny Side of the Hudson,”celebrated the influence of Washington Irving on our Rivertowns region of New York and featured floral and horticultural exhibits inspired by characters and situations on the pages of Irving’s books. Guests to the show, which was open to the public on May 10 and 11, were greeted with vases of cut stems set out in tables on the patio in front of the Lyndhurst Carriage House. Inside the tent, an entire wall of tables was set up with glorious displays of blooms cut from exhibitors’ gardens that morning. All were judged for beauty, horticultural perfection and grooming. Categories included peonies, viburnums, lilacs, and rhododendrons. The “Best in Show’ award for Horticulture went to Lydia Wallis of the Southampton (NY) Garden Club for her cut specimen of an epimedium. At the entrance to the Carriage House, below, the Floral Design section opened in a dramatic fashion with mass arrangements of primarily yellow flowers — such as those grown at Sunnyside Cottage, Washington Irving‘s home — displayed on pedestals. “The Book Party” class, channeling a book signing for Washington Irving’s literary friends that included sips of schnapps and games of dominoes, was the theme of the above winning table setting by Colleen Hempleman and Christina Vanderlip of the Hortulus GC. Judges and guests admired the rich, masculine color scheme and rare, deep-toned flowers. This table setting by Renee Shamosh and Ellen Shapiro of the Garden Club of Irvington featured an arrangement of tulips, hydrangeas and wildflowers and a faux feather made from paper and wire. According to GCA rules, real feathers are not allowed, challenging all entrants in the class to devise a way to depict an appropriate 19th-century writing instrument. A category entitled “Sleepy Hollow Awakenings” featured arrangements of flowers in bud and in full bloom, displayed in niches. This arrangement by Emily Meskat and Kristina Bicher Rye GC took first place in the class. Richard McKeon, a former GCI member, now with the Garden Club of Millbrook, created the second-place arrangement below. “Short Stories,” miniature arrangements displayed on a mantelpiece, could not exceed five inches in height, width or depth. The winner, below, was Amy Hardis of the Little Garden Club of Rye. The Rosie Jones award for “reflecting the spirit of growing with joy and enthusiasm” went to the above “Mother and Daughter” pair of coleus propagated by Julia Burke of Rye Garden Club. “Rip Van Winkle” troughs could feature Alpine species or cultivars. dwarf conifers, and/or succulents owned for a minimum of three months. A special club award went to Ellen Shapiro, whose trough (below) included succulents grown from cuttings taken from her daughter-in-law’s San Francisco roof garden. Our “Imaginary World of Rip Van Winkle and The Legend of Sleepy Hollow” children’s class, hosted in conjunction with the Irvington Public Library, displayed fairie houses made by children 8 to 12 years old. Proud exhibitors included Fitz Anderson, above, and Jordana Laks, below, with her mom, Lisa Izes. In the “Inside Story” photography category, honors went to Susan Van Tassell of the Short Hills, NJ, Garden Club, for her macro shot of a dahlia, and Dori Ruff of GCI for her study of the inner workings of a peony. The conservation and education exhibit by Catherine Ludden demonstrated the beauty and benefits of adding native plants to your garden — through a slide show and a 20-page handout illustrating “Plant This, Not That” plant pairs. This exhibit, designed by Ellen Shapiro, won a judge’s commendation. It included an exquisite arrangement of native plants, below, from Cathy Ludden’s garden. A few of the 25 GCI members who organized and staged the show took a break from setting up the exhibits. Clockwise from left: Renee Shamosh, Jo Gurley, Ellen Shapiro, Harriet Kelly, Linda Azif, and Heather Kenny. Photos in this post by Steve Beech and Ellen Shapiro. by famed garden writer and designer Margaret Roach. Margaret provided insights for making your garden a visual treat every day of the year, including lists of her favorite plants for all-season interest and color. To download the talk handout, please click here. The lecture was followed by signing of her books: And I Shall Have Some Peace There and The Backyard Parables: Lessons on Gardening, and Life. This spring, may your garden be as lovely as Margaret’s! Every GCA garden club in New York state was required to enter a mixed planting in the ”Kaleidoscope” class at the GCA Annual Meeting in Rochester: Plants we’d propagated and/or grown in or our gardens composed in a 14″ terra-cotta-colored pot. Each club could choose a color scheme: yellow-orange, pink-red, or blue-purple. GCI chose blue-purple. Starting last September, we approached the project as a club, with members rooting cuttings and planting bulbs. Over the last few weeks, we combed our gardens for blue flowering plants. The harsh winter and late spring didn’t make things easy. 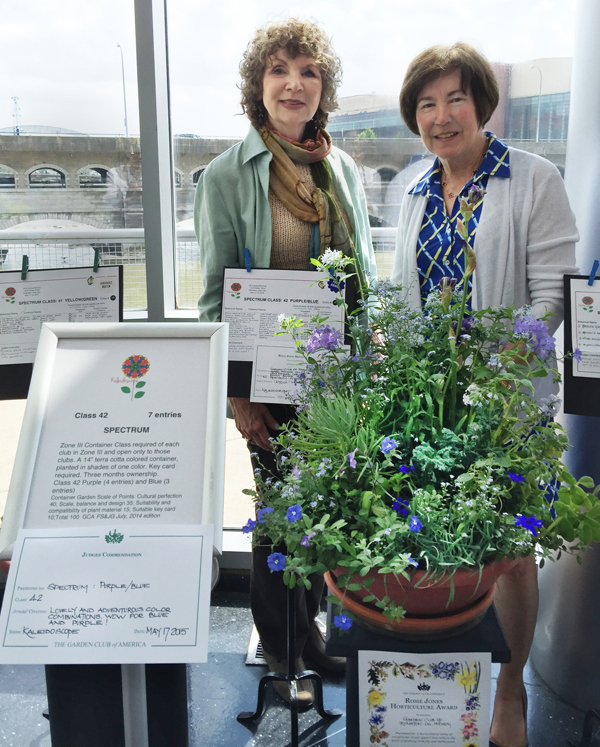 Renee Shamosh and Anne Myers in Rochester, NY, with the club’s winning container planting. The container planting was designed by Ellen Shapiro, Renee Shamosh and Donghai Zhen. Renee contributed phlox, streptocarpus, evolvulus, forget-me-nots, and ‘super blue’ pericallis. Ellen contributed wood hyacinths and blue chalk fingers. Club president Susan Weisenberg contributed bearded irises, the centerpiece of the arrangement. Also adding to the arrangement were plants contributed Bunny Bauer, Deb Flock, Nora Galland, Cena Hampden and Anne Myers: the Cape primrose, comfrey, dwarf blue cypress, amsonia and forget-me-nots, respectively. 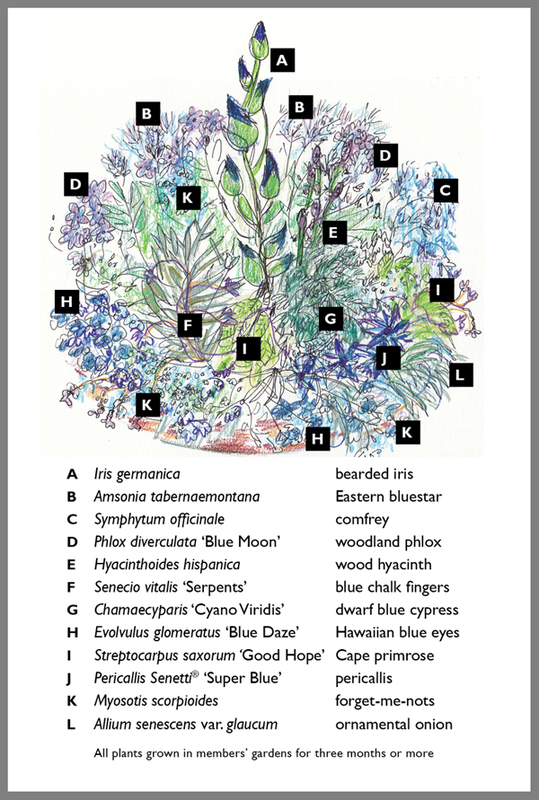 The entry was accompanied by the following key card, indicating to show visitors the botanical and common names of the plants and their relative position in the container. 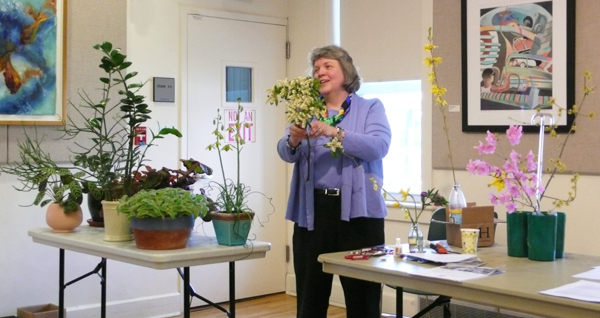 GCA Zone III (New York) Horticulture Representative Elizabeth D. Hickman recently spoke to our club and demonstrated how to choose, display and groom plants for horticulture exhibits at the flower shows. Here, Beth is critiquing members’ plants, describing how they should be groomed in order to be “passed” or allowed to be displayed in the competition. For example, in addition to no evidence of insects or disease, there can be no brown edges or yellowed leaves. She noted that some of the members’ plants were imbalanced, too leggy, needed fertilization, or were displayed in containers that clashed with the plant rather than enhancing it. 1. Cut stems in the coolest part of the day, out of direct sunlight; early in the morning or near sunset is best. 2. Cut the stems at an angle for maximum surface. 3. Split the ends of woody-stemmed flowers or branches. For flowers that bleed milky juices, like euphorbia and poppies, pass the cut end through a flame to seal the cut. Sunday was an almost-perfect early summer day, and a record crowd of hundreds of people enjoyed an afternoon of observing, learning about, and photographing roses while they listened to live chamber and choral music, sipped punch, munched on cookies, and just relaxed. Rose experts from the Garden Club explained the finer points of planting, caring for and pruning many varieties of roses. The Rose Garden, tended by members of the Garden Club, is on the grounds of Lyndhurst, a 67-acre National Trust for Historic Preservation property on the Hudson River. It is open to the public, free of charge, daily from dawn to dusk. Rose Day is an annual event, the first Sunday in June. What should I plant in the shade? Does this plant like to be wet or dry? Should I let it grow or pinch it back? Will the deer eat it? Every year, on the Saturday before Mothers Day, Garden Club members help guests to our Garden Fair and Plant Sale at the Lyndhurst Greenhouses choose plants and provide tips on care that, we hope, will contribute to the success and beauty of many gardens in the area. An added bonus: the daylilies, coleus and hostas that are unsold are donated to Lyndhurst to enhance the plantings at this National Trust property. It needs a little tough love to thrive and bloom. When it comes to pruning roses, you have to be cruel to be kind. Grit your teeth and prune, prune, prune. So advised the expert rose growers of the Garden Club of Irvington yesterday—a beautiful, warm Saturday—during the club’s annual Rose Pruning Day. Under the tutelage of GCI rosarians Pru Montgomery and Bunny Bauer, club members learned how to properly use clippers, where to cut, and how much to cut (more than you think). There was a good turnout of local people who were eager to learn rose pruning techniques to use in their own gardens. All participants said that they’re looking forward to Rose Day on June 3 and promised to come back to enjoy the festivities and see how their handiwork turned out.